Divestment campaigns targeting the fossil fuel industry have become a prominent occurrence for Canadian higher education institutions in recent years, and it is anticipated that this trend will not end anytime soon. The goal of the workshop was to help institutions learn methods to respond to divestment requests while ensuring their social objectives, environmental concerns, and fiduciary responsibilities are duly considered, carefully balanced and positively conveyed. With 10 speakers and participants from 31 different institutions, the workshop offered a number of valuable pieces of information and best practices. 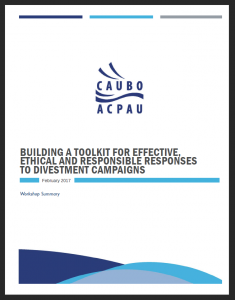 CAUBO has prepared a Workshop Summary document to maximize the value of the workshop content, facilitate the sharing of information with the entire CAUBO community and serve as a catalyst to continue the discussion around the topic of divestment. The summary is also available in French. The CAUBO Knowledge Centre contains several other resources related to this topic, including the material presented at the workshop. If you are or someone at your institution is working to respond to a divestment request, we encourage you to read the workshop summary and explore the other resources in the Knowledge Centre. As a new CAUBO initiative, we welcome your feedback and look forward to adding further resources to our Knowledge Centre. Download the Workshop Summary today.